After a long day, one of the best ways to unwind is to hang out with some friends, have a few beers and have great conversations. Whenever you get the craving to do just that, drop by The Willard for a great time with great people. Located in the heart of Downtown Franklin, we are proud to offer a fantastic dining experience to all our patrons. Our bar boasts a large selection of beers and spirits to choose from—which is an understatement, really. 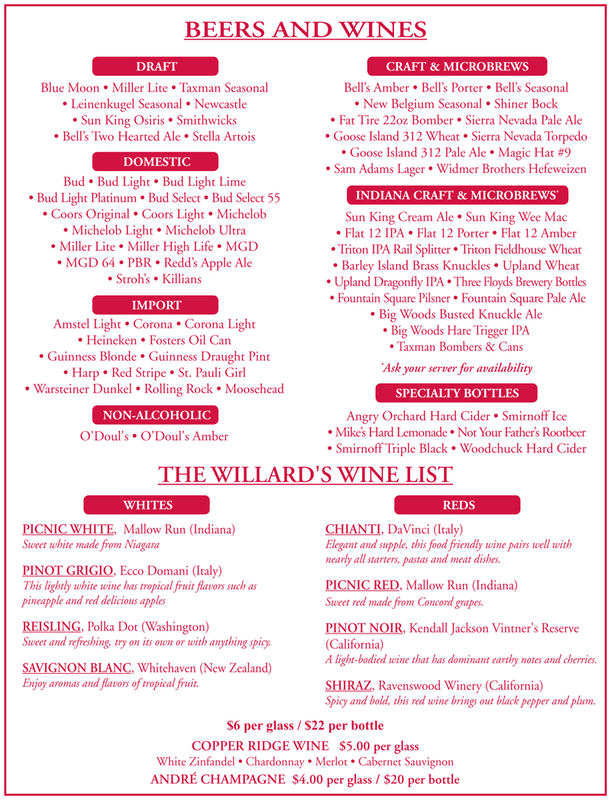 To be more precise, we have over 75 different alcoholic beverages on our Beer and Wine List. This allows us to offer more options to match the taste of every customer. We have stocked our bar with some of the finest beers and spirits available in both the local and international market. From social drinkers to wine connoisseurs, there is always something great waiting for you at The Willard. Whether you want to have a bottle of cold beer or have a glass of white wine, we’ve got you covered. * In accordance with State Law, we will not serve alcohol to those below the age of 21. Unsure of what drink you’ll be having during your visit? We understand that having an overwhelming selection of beers and spirits can make it difficult to choose which one to order. When this happens, simply describe what you are looking for to one of our servers or to our bartender. We are more than happy to offer suggestions that match your tastes to a tee. Additionally, each food item on our menu has been carefully chosen as they form a fantastic match with our entire beer and wine list. Whether you choose to have classic favorites such as our chicken wings, pizzas, and sandwiches, or choose to try our daily specials, we have the perfect beverage to match your tastes and your meal. For more information about the beers and wine we offer or to make a reservation at the bar, please do not hesitate to call us at . We look forward to having you! Are you celebrating your birthday soon? Perhaps you’re planning a reunion with close family and friends in Franklin? 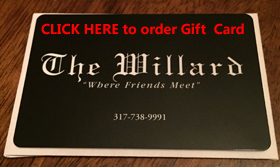 Whatever the occasion, The Willard offers a fun and convenient location. With a great view of the Johnson County Courthouse, our smoke-free and family-friendly restaurant is more than happy to offer our private bar for private functions and parties, or for large groups. We also have a large outdoor dining area for those looking for an al fresco experience. Simply call us and place a reservation.